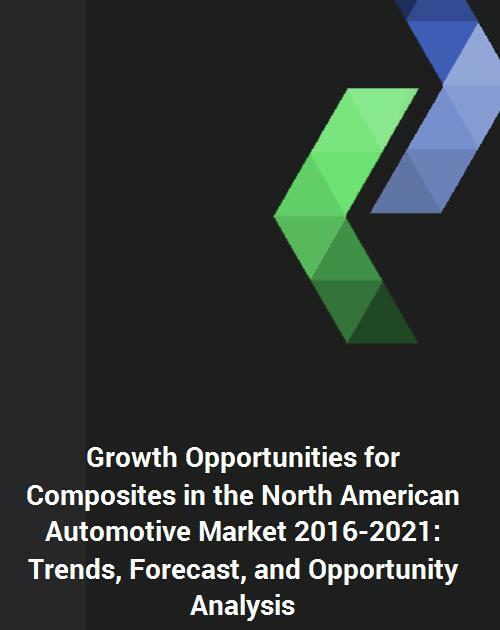 Growth Opportunities for Composites in the North American Automotive Market: Trends, opportunities and forecast in this market to 2021 by application type (interior, exterior, power train, chassis, under the body systems, and others), resin group (PP composites, PBT composites, vinyl ester composites, polyester composites, PA composites, epoxy composites, phenolic composites, and other composites), material (SMC, BMC, LFT, SFT, GMT, Phenolic composites, PU composites, and other composites), fiber composite group (glass fiber composites, carbon fiber composites, and natural fiber composites), resin group (thermoset composites and thermoplastics composites) Country (US, Canada, and Mexico) in North America. Emerging trends, which have a direct impact on the dynamics of the industry, include increasing penetration of thermoplastic and carbon composites. Strategic alliances between OEMs, carbon fiber and resin suppliers in the automotive industry are also the emerging trends. A total of 84 figures/charts and 22 tables are provided in this 165-page report to help in your business decisions. Sample figures with some insights are shown below. To learn the scope of, benefits, companies researched and other details of this report, download the report brochure. Continental Structural Plastics, IDI composites, DuPont, and Interplastic Corporation are among the major suppliers of composites in the North American automotive market. On the basis of its comprehensive research, the author forecasts that the power train system is expected to be the largest market and chassis system are expected to show higher growth during the forecast period of 2016 to 2021. Within the North American automotive composites market, sheet molding compound (SMC), bulk molding compound (BMC), glass mat thermoplastic (GMT), short fiber thermoplastic (SFT), long fiber thermoplastic (LFT), continuous fiber thermoplastic (CFT), phenolic composites, polyurethane (PU) composites, natural fiber composites and other carbon thermoset composites are the major materials. SFT is expected to remain the largest market by value and volume, mainly driven by small complex shaped components in under the hood applications. By resin type, polypropylene (PA) composites are expected to remain the largest market by value and volume consumption. High resistance to abrasion, low friction characteristics, electrical resistance, heat resistance, and good chemical resistance are the properties which drive the PA composite demand in automotive. Q.1. What are some of the most promising, high-growth in the market by application type ( interior, exterior, power train, chassis, under the body systems, and others), resin group (PP composites, PBT composites, vinyl ester composites, polyester composites, PA composites, epoxy composites, phenolic composites, and other composites), material (SMC, BMC, LFT, SFT, GMT, Phenolic composites, PU composites, and other composites), fiber composite group (glass fiber composites, carbon fiber composites, and natural fiber composites),resin group ( thermoset composites and thermoplastics composites) Country ( US, Canada, and Mexico) in North America? Q.10. What M&A activity has occurred in the last 5 years?